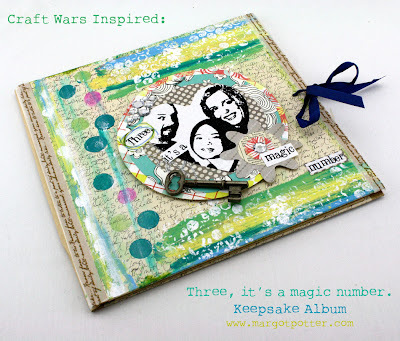 Last week the Craft Wars contestants were asked to make a Keepsake Box using keys and locks. I don't have any locks handy...but I do have some lovely vintage skeleton keys and I got this nifty keepsake album from Faber Castell at CHA. 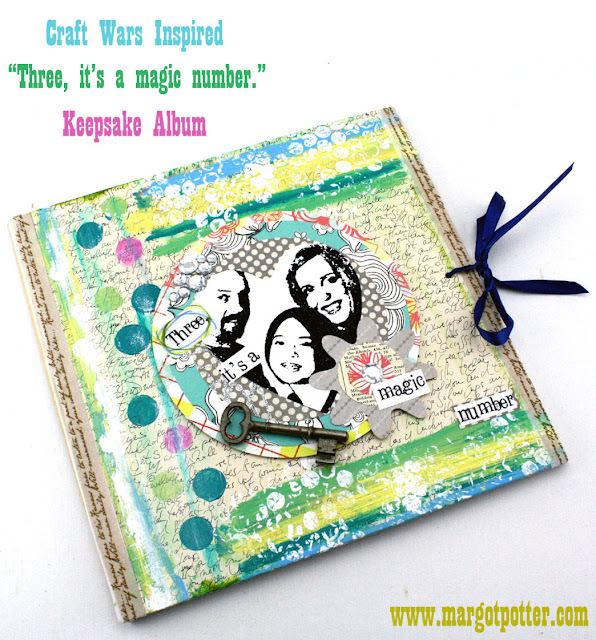 You could use any scrapbook or photo album you have handy. 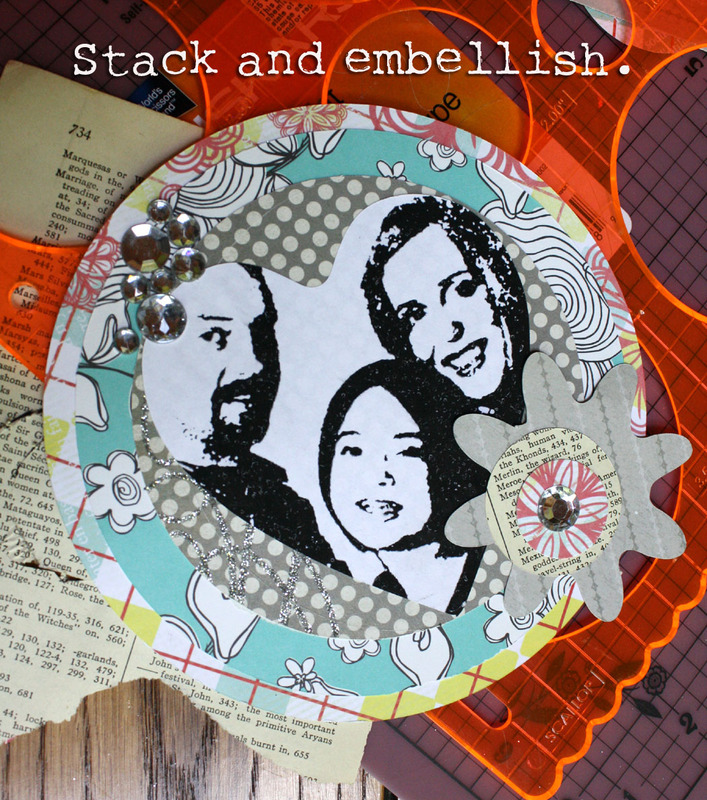 Just start by covering it with off white scrapbook paper and either stamping or writing text to add some interest to your background. You may even be able to find some paper that works. I'd adhere it with an acid free glue and let it dry. 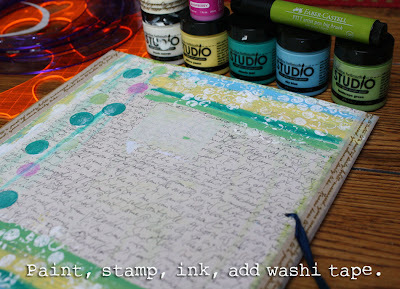 Using dry adhesives might cause the paper to bubble up when adding paints and water. 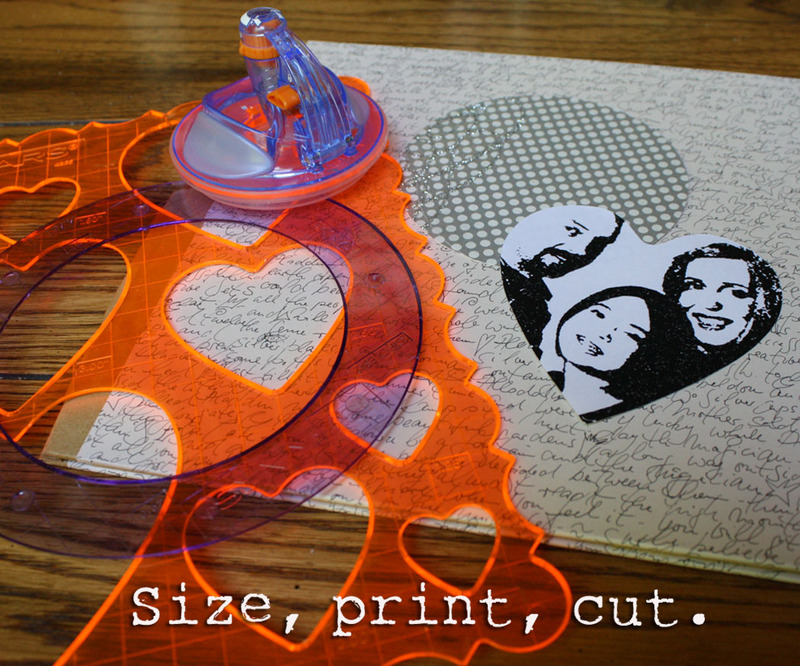 I took a favorite photograph of my lovely family into Photoshop, played with some filters and turned it into grey scale, sized, printed and cut into a heart shape with my fabulous Fiskars cutting tools. 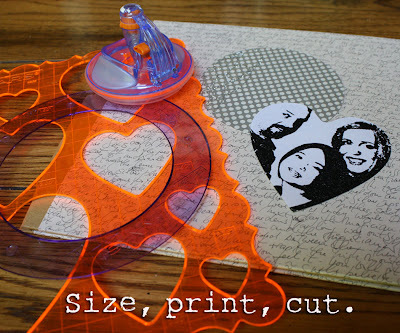 I cut some coordinating scrapbook and vintage book pages for a frame using the Fiskars circle cutters, added some plastic rhinestones, a few key printed words, the skeleton key and some Washi tape edges and attached it all to the album with foam stickers, tape runner and acid free Tacky Glue and that...was all she wrote. I love this so much, I want to make some similar canvases for our living room wall. When I make art, I like to just dive in and do it. I don't think too much about what might happen or where I'm going. I let the muse take my hand and guide me. Don't get me wrong, I usually have some kind of a plan and a vision, but it's an organic, flexible one. If something gets 'screwed up', I roll with it. I am not afraid of color or layers or textures or not being perfectly perfect. My biggest challenge is knowing when to stop. Because it's often that last thing you add at the last minute that...well...is one thing too many. And you know what, it really doesn't matter what happens, because the point of making art isn't the thing you make, it's the making of the thing. If it turns out fabulous, even better, but even if it doesn't, as long as you enjoyed the journey that truly is all that matters! Rules are for math equations and science experiments, art is about letting go of the intellectual, ordered, structured mind and letting the playful, emotional, non-judgmental side come out and have a party! As soon as we tell ourselves we aren't artists, well, we aren't. So make yourself an "I am an artist" pin and wear it proudly! Don't forget to tune into Craft Wars at the new time for our episode, 8pm EST on TLC! 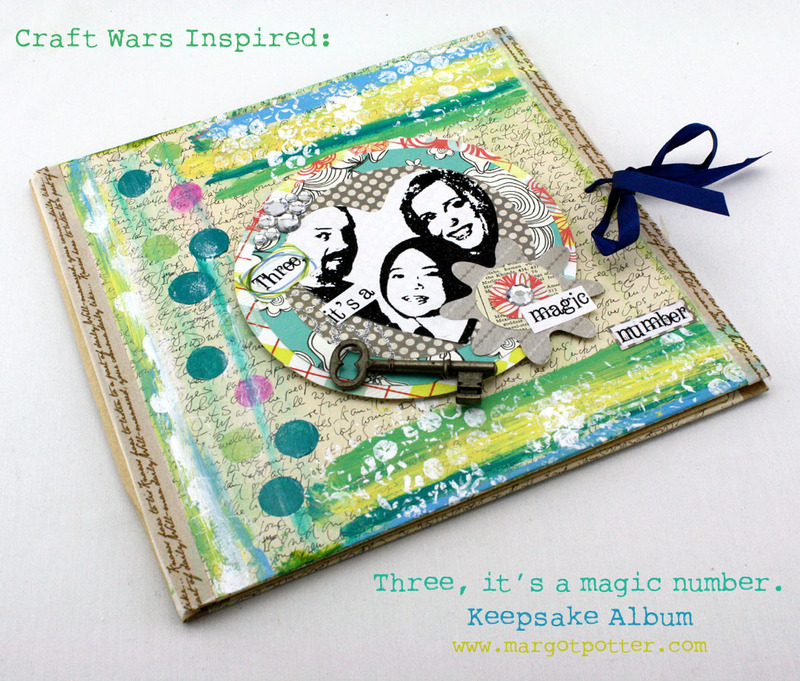 And check out what the other Craft Wars Vets made inspired by last week's episode! Pattye Duffner made a lovely wishing tree. Cheryl Burchett made a clever blue jean bouquet. Esther Hall guest posted for Nikki McGonigal sharing her divine candlestick lamps! Angela Daniels made an awesome Krafty Coco t-shirt for Coco the Chicken! Lisa Fulmer made a stunning keepsake box. Andrea Currie whipped up a sparkly trophy.